This entry was posted on February 11, 2016 by Y Hasegawa. Shikibuton Made by "Santa's Elves"? Thanks to the incredible generosity of Ashley, her awesome mom (and fun family), we were sent (and give permission to share!) 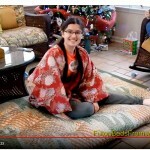 this very cool video of Ashley getting her Christmas morning surprise of a single shikibuton. We're extremely happy to be a part of this very fun moment in time in Ashley's life. Sincerely Ariagatou Gozaimasu! to Ashley and her family for allowing us to share this private family video with the World. Thank you so much for all your help. It has been great to receive such excellent customer service.... something that has been lacking more and more here in the States. Maybe I can convince my mother to buy one for me as well, haha!